When he's not admittedly great as an actor on Community and formerly as a writer on 30 Rock, Donald Glover has spread himself thin and attempted to launch a rap career as Childish Gambino. Last month, he issued his debut long-player Camp, where our review observed that "his flow is sloppy and often offbeat, and the punch lines are split between genuine wit and strained pop references." 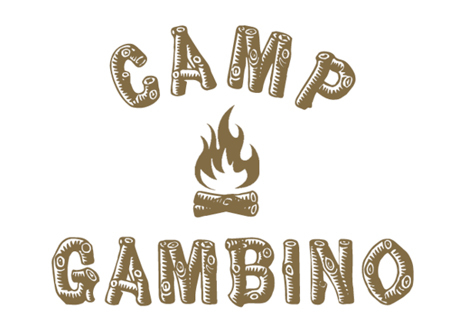 Still, dude is trying, and he'll try even harder with an upcoming Camp Gambino tour. The run of shows includes a New Year's Eve party in Utah, along with a North American jaunt through March and April. In addition to a ton of stops in the U.S., Glover will do his best to win over Canadian audiences with shows at Toronto's Sound Academy on March 24 and Montreal's Metropolis on March 25. Before you complain that he's not coming to your corner of Canada, you might want to count yourself lucky. For support, Danny Brown will be onboard throughout the tour. As a bonus, the author behind the No Money Down Tumblr suggested that he or she was a ghostwriter on Childish Gambino's album, offering up a series of hashtag rap lines that didn't make the cut. Some of our favourites are "And I'm so high, I can see ya'll from up above / I smoke that good green: [pause] Airbud" and "Killin' the competition, my oh my / Smart like the Start Bar: [pause] Windows 95." Read the full list here.